Secret Cinema is an organisation that stage cinema events around London and the UK, selling tickets to audiences without them knowing what film they're about to see. Events incorporate theatre, live music and food with the aim of recreating the setting of the film to be screened. Next week we are going to see something. But we don't know what. 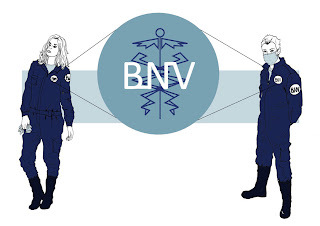 We just know we need to dress as Matter Analysts in navy blue jump suits with latex gloves, face masks and boots on and have joined a secretive organisation called Brave New Ventures. It seems like it might be something like Alien or one of it's sequels.Or maybe even it's prequel? The plot thickens. Watch this space. It starts tonight! Bugsy Malone directed by Alan Parker in The Troxy Cinema, Commercial Rd; Apr. Prometheus directed by Ridley Scott in Euston Shed; June.